Cofrad Mannequins designs and produces high-class mannequins for many of the world’s leading fashion retailers. With ten different collections of mannequins ranging from ages 2 to 14 years old and adding a new line every year Cofrad needed to update and reshoot their kid’s catalog. 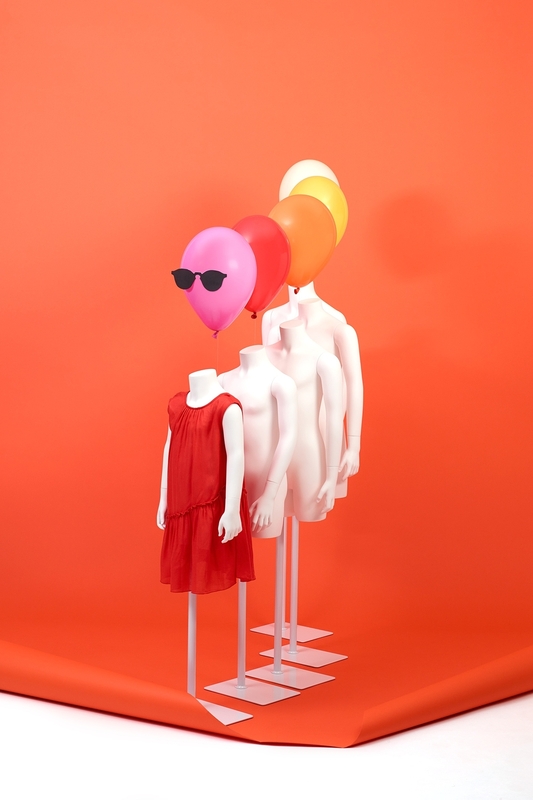 I came up with the idea around creating whimsical stories using cheerful giant balloons while emphasizing the uniqueness of each collection. This allowed the mannequins to still be the focus in the shots while infusing moments of humor and instant happiness. “Pucci Kids” is a bold and modern collection that shows kids in motion and fun positions. To celebrate the energetic youth we used silver balloons and wrote a simple and spunky statement, “KIDS”. 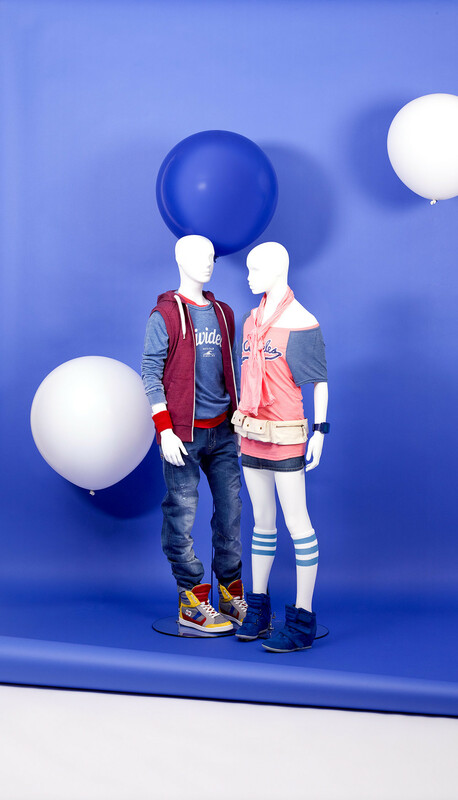 We introduced a vibrant red color to the background that complemented the silver balloons, and made the white mannequins stand out while still adding a sense of playfulness and dynamism across the photos. “Image Kids” is an abstract understated collection inspired by urban kids. To accentuate the casual attitudes we used street wear clothing and grouped them into cool squads making them interact with each other like in real life. The white and blue balloons flying away create a visual depth and show the fast changing environment. The “Junior Club” is a realistic line that offers an array of expressive faces and postures. 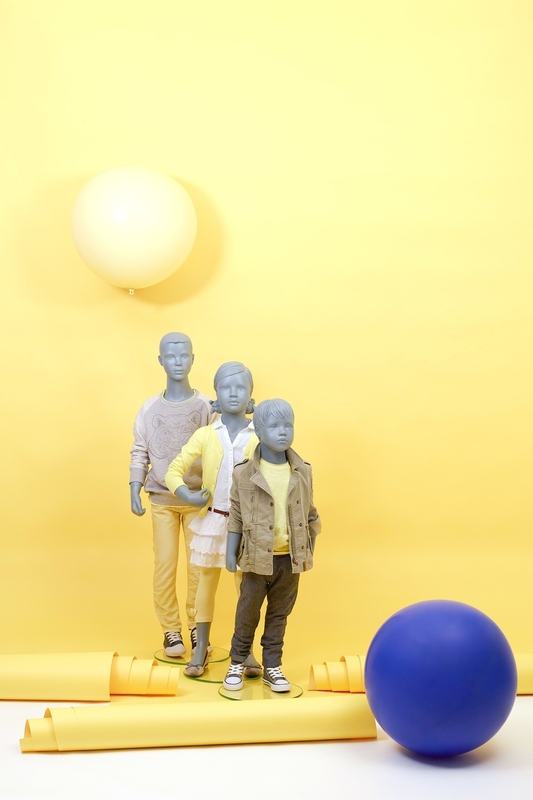 To accent the key features of this line we used a yellow color palette to draw attention to the mannequins and their faces. Colorful balloons were introduced to create a dynamic interest against the vibrant background moving from the ground up. We envisioned this collection as little girls and boys that are always aspiring to be grown up and love mimicking their parents by either drawing funny mustaches on their faces or wearing mom’s heels. Inspiring from these cute moments we disguised balloons with fake mustaches and sunglasses creating unique abstract displays. 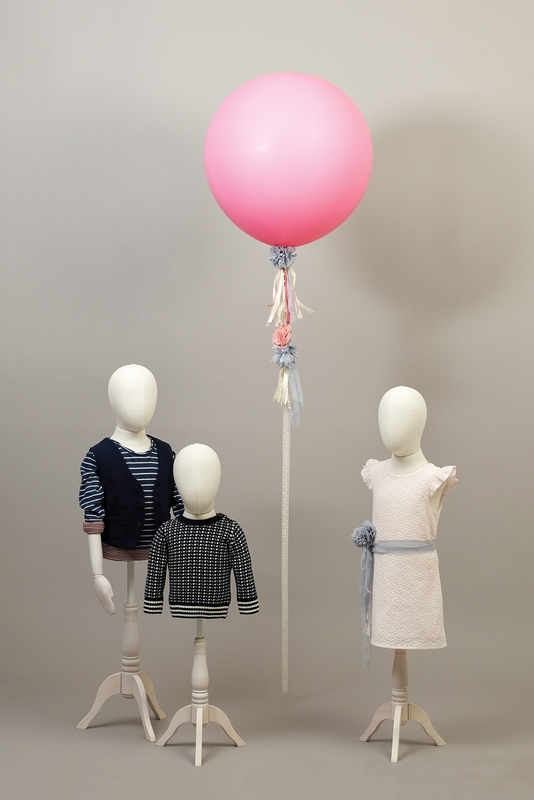 Inspired by children’s vivid imagination we created absurd little stories for this collection where in one a little boy flies away with a balloon and another with a group children playing with transforming paper creatures into planes. “Wonderkids” is a contemporary collection without overt realism and has dream like features. With a sense of harmony we created a candy world with paper waves, sweets on the ground and a giant bubble gum balloon floating in the sky. To accent the premium classic mannequin line that combines adjustable head and wood articulate arms we elevated the visual experience by creating minimalistic compositions. Selecting a muted color palette we created an enchanted and soft atmosphere where the mannequins appear calm and impeccable. “Simon Sez” is a playful and happy collection with poetic and delicate poses. Our goal was to capture that joyful moment when kids get dressed up for a birthday party and all the excitement that happens at the party. Giant balloons and confetti was integrated into the scenes to accent the festive atmosphere.